Off to the N Tower in Seoul? See our insider advice for a queue-free visit as well as opening times and phone numbers! Choose the right day for your visit: weekends are very busy, particularly Saturdays. Coming on a weekday would be a good way to avoid queues! Most visitors arrive at the Tower in the evening: the views are considered more spectacular at nighttime (though you may decide otherwise). Therefore the peak time is around sunset and about two hours after it (the queues may take around an hour in peak season). In order to be at the Tower at sunset time - get there early to avoid watching the sunset in the queue for the cable car. Coming before 6 PM generally lets you be ahead of crowds. There’s no big sense in going to the Observatory when the weather is bad. Choose a bright and sunny day for your visit. Don’t stay at the tower until the last moment - the queues for the last cable cars can be impressive and you risk being late for metro, which stops at around midnight. The Tower has become a must-visit spot for local and foreign couples, who head here to lock their “padlock of love” onto the railing - and there are thousands of love locks scattered around the base of the tower! In case you’re coming with your sweetheart - don’t forget a lock (but if you do - you can buy one at the souvenir shop on place). Though the best views are from the Observatory (level 3F), you can enjoy a panoramic view of Seoul on the Glass Terrace (1F), Roof Terrace (2F), and in the lobby without paying an admission fee. 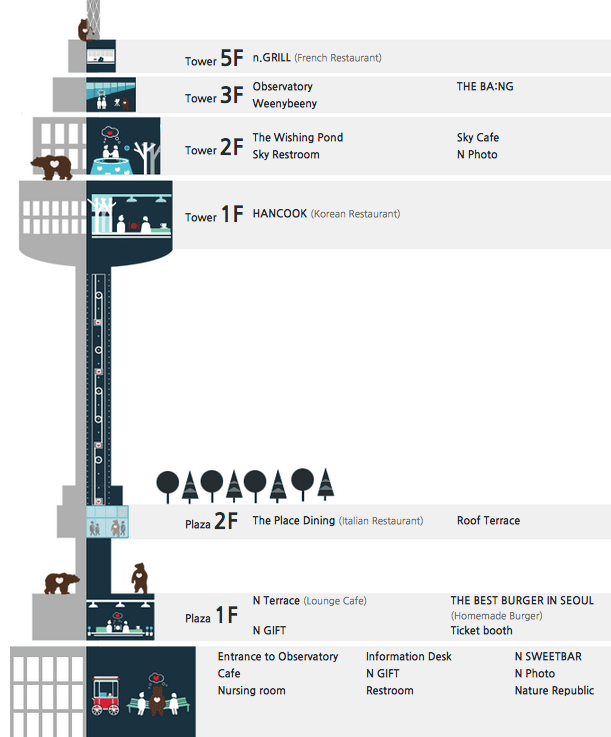 Before you go back from the Observatory to the ground floor, take the staircase down one level and go to the sky restroom - the highest restroom in Seoul with incredible views! Admission to the Observatory is free if you dine at N Grill with a full-course meal or with a lunch set. There are other combinations, check them here. The reservation is highly recommended well in advance, especially in high season. If you want to take an entire picture of N Seoul Tower, you have to go to the Roof Terrace at 2F level and lie down on the floor down the stairway. The best time to visit Seoul is either spring or autumn: that’s when the crowds are moderate and the weather is the most beautiful. Try to avoid coming during the busiest months of July and August: first, there’s a rainy season in July, and, once it’s finished, that’s the summer holidays for Koreans. The next two weeks would be the peak season for every tourist attraction in the country! Winter may be very cold, and it’s however crowded, especially during the periods of Christmas and New Year’s holidays and the Lunar New Year - the later sees most locals move to their hometowns for a 3-days holiday, and transport fares increase enormously! The autumn color season is another peak period, with the majority of tourists moving to the mountains. October sees the highest hotel occupancy rate, though it’s one of the most beautiful periods of the year. If you’re coming in spring - try to avoid the week between the last Friday of April and the first Saturday of May, that’s quite a busy period. March, June, September and November are off-peak months. Child (3-12), elderly (65+): 7,000 won. Child (3-12), elderly (65+): 3,500 won. Child (3-12), elderly (65+): 5,500 won. By cable car: an easy and beautiful way to get to the Tower, though a bit pricey (check the rates) and it may get quite crowded during the peak hours. By bus: Namsan Sunhwan Shuttle buses (№ 02, 03, 05). By car: cars are not allowed to enter the Namsan Mountain, use the nearby parking lots (Seoul Square, National Theater of Korea, Namsan cable car, Namsan park). On foot: about a 30-minutes walk (you need to be fit, as it is an upward climb). Feel free to comment or give your opinion on N Seoul Tower (Seoul, South Korea). However, please agree to respect our terms. Please don’t post defamatory, insulting or disparaging comments- as we will have to moderate them. Instead, explain what happened in a factual way.